Modern European restaurant Sühring earns its second Michelin star, while 10 new restaurants in Bangkok and Phuket are lauded with one star. Michelin has announced the closely-watched MICHELIN Guide Bangkok, Phuket and Phang-Nga 2019 Selection. In its second edition, the world-renowned guide recognises 27 dining establishments in Bangkok and Phuket — 23 of them are awarded with one star each and four attain two stars each. Sühring, a contemporary European restaurant in Bangkok, is elevated to a two-star rating after it was lauded with one star last year. The restaurant joins three other two-Michelin-starred restaurants — Gaggan, Le Normandie and Mezzaluna on the list. The one-star category has the most movement with 10 restaurants across Thailand making their debut on the list. They are Canvas, Gaa, Le Du, Methavalai Sorndaeng, PRU, R-Haan, Ruean Panya, Saawaan, Sorn and Suan Thip. Popular Thai shophouse restaurant, Jay Fai, retains its one-star accolade and is the only street food eatery in the honour roll. Chefs from dining establishments that received stars in the MICHELIN Guide Bangkok, Phuket and Phang-nga 2019 selection. He adds: “With Thailand’s Andaman Sea offering an opulence of refined ingredients and endless culinary inspiration, it’s no surprise that Thailand’s south is home to one of the most innovative restaurants in our selection. Mathias and Thomas Sühring helm Sühring, which is lauded with two Michelin stars this year. Run by German twin brothers, Mathias and Thomas Sühring, Sühring, which is located in a restored 1970s townhouse in Bangkok’s Yan Nawa district, has received acclaim for combining traditional cooking techniques with contemporary European influences. Thai cuisine is prominently featured among the new one-starred restaurants — seven out of 10 restaurants in the list serve Thai cuisine. Contemporary restaurants include Le Du, which received a Michelin Plate last year and Saawaan, which uses local Thai ingredients such as organic rice paddy crab from Sing Buri and squid from in Krabi. Another new one-star restaurant is crowd favourite Methavalai Sorndaeng, which is known for dishes such as crispy rice noodles in sweet and sour sauce, and spicy lemongrass salad served alongside with live 1980s Thai music and views of the Bangkok's iconic Democracy Monument. 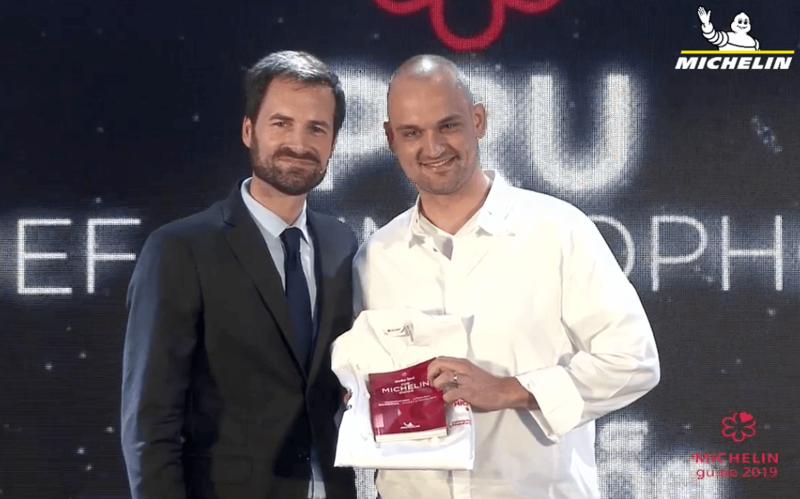 PRU's head chef Jimmy Ophorst receiving the restauran's one-star accolade from Gwendal Poullennec, International Director of the MICHELIN Guides. The MICHELIN Guide Bangkok 2019 also extends its reach to two Southern regions, Phuket and Phang-nga for the first time. In Phuket, innovative restaurant Pru receives one Michelin star. The restaurant, which is situated in a luxury resort, uses many ingredients from its 96-hectare organic farm and uses milk sourced from Krabi to make its in-house butter. RELATED: Find out what the MICHELIN Guide Inspectors have to say about the MICHELIN Guide Bangkok, Phuket & Phang-Nga 2019 selection. Good food does not have to be expensive. The MICHELIN Guide Bib Gourmand selection was created to allow everyone to eat well without spending more than HK$400 while you are in Hong Kong.